Hydrangea varieties, free pictures of hydrangeas, and hydrangea colours! 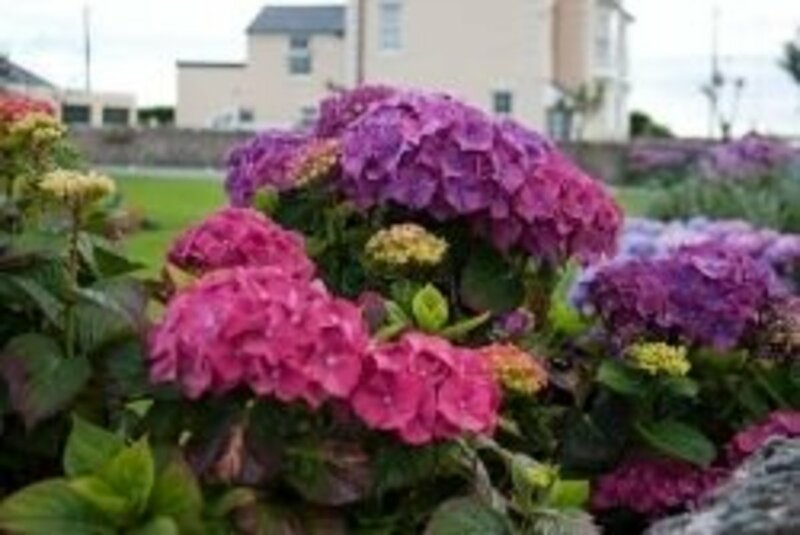 Hydrangeas here in Britain have put on a spectacular show this Spring and Summer. We have suffered through a very wet June and July with some places getting more than a month's rain in one day. However, the grey skies have a silver lining. Hydrangeas, which are always beautiful here, are magnificent this year. 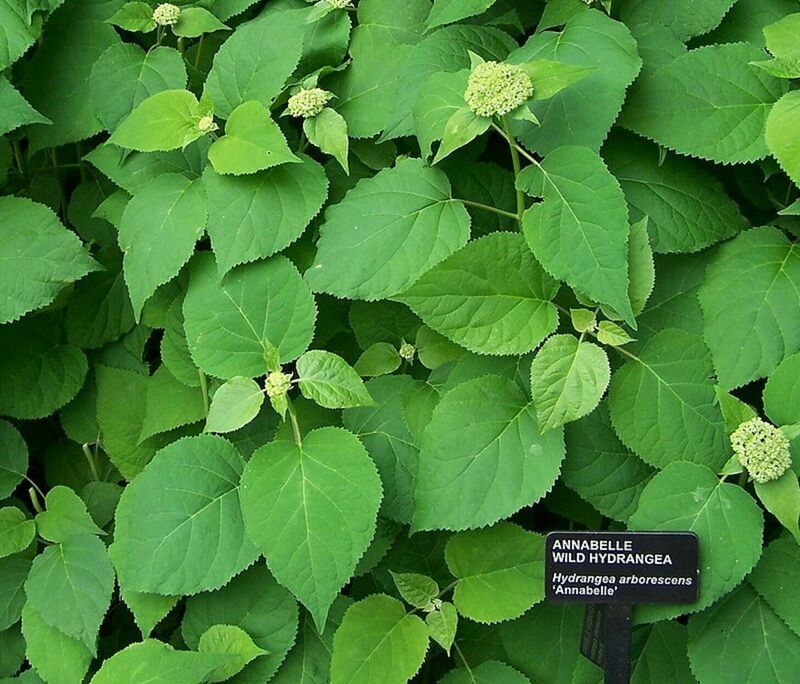 These thirsty, shade tolerant plants have thrived , the hydrangea colours are vibrant, the flowers are abundant and the leaves, which often start looking yellow and crinkled in a normal summer, are a rich green. During my walks around this area of Mid-Wales, where I am fortunate enough to live, I have documented the beauty of these hydrangeas in pictures These hydrangea pictures are free for personal or commercial use. I only ask that you credit and link back to this website. 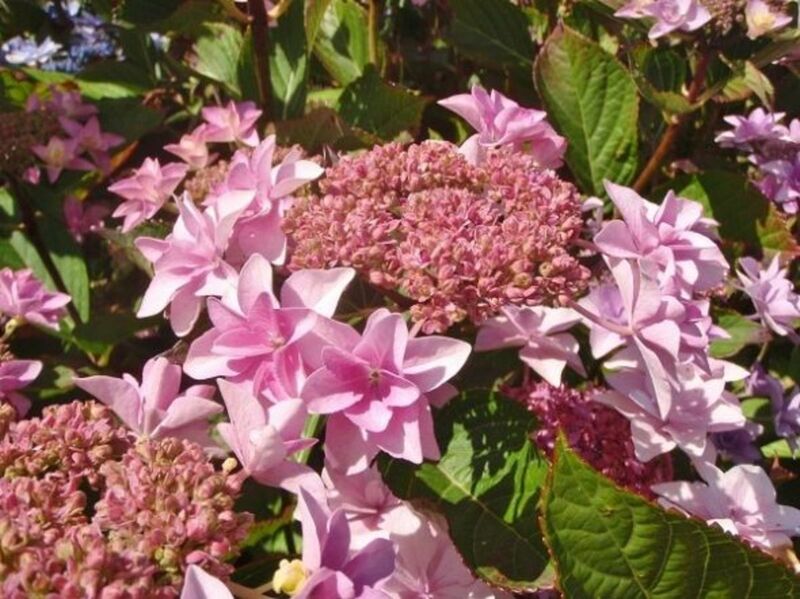 I have also included some information about hydrangeas for those of you also interested in growing and caring for hydrangeas. 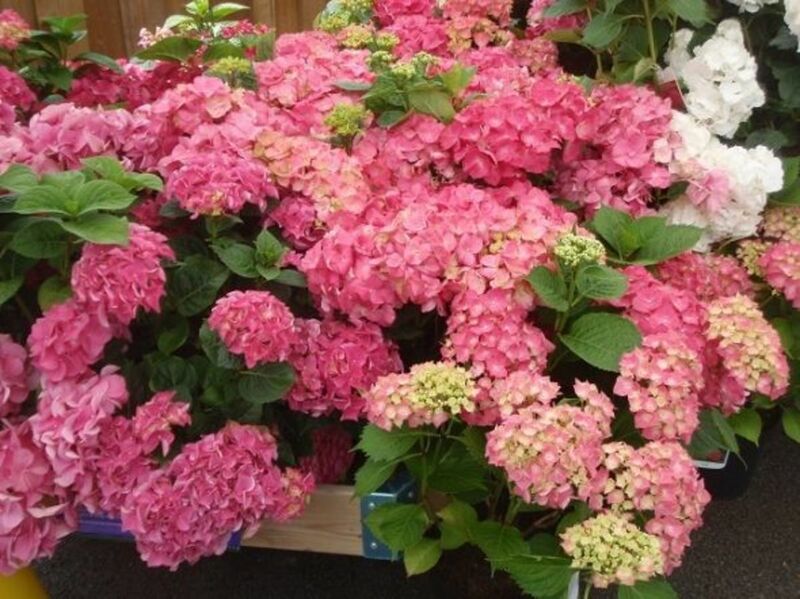 Hydrangeas come in many colours depending on the variety and the PH balance of the soil. They come in white, pink, purple, red, and blue and some have several colors on one bloom. They also vary in shade: the white can be a creamy colour bordering on yellow; the piinks, purples and blues can be vibrant or very pale and the reds can be deep or fiery. They tell us that summer is here. 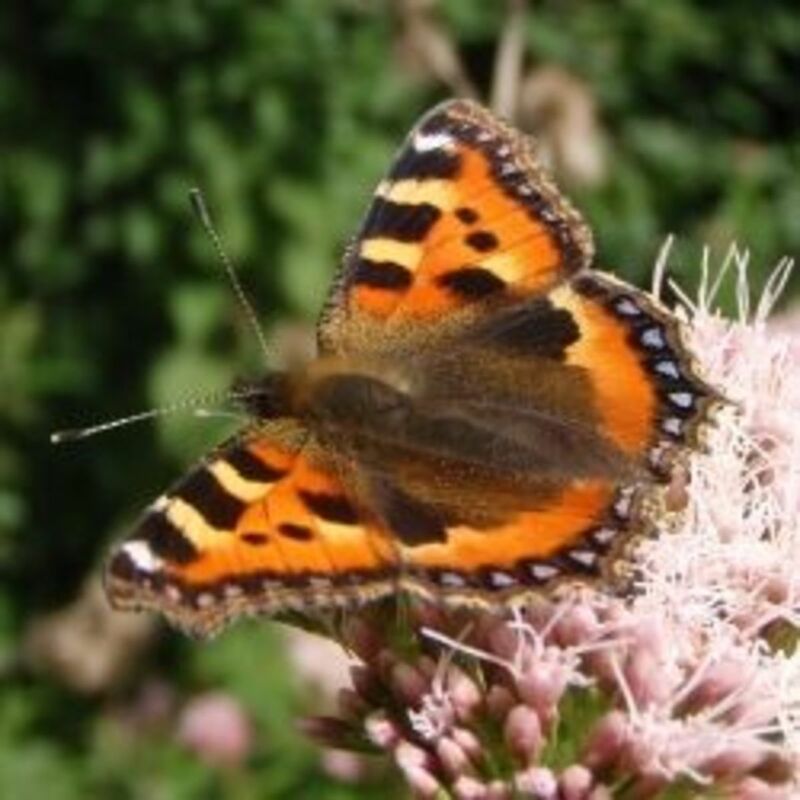 It is now July 2013 and the weather has been unseasonably warm for Wales. We had a lot of rain in the Spring and now the warm temperatures and sunny skies have accelerated the hydrangea blooms. Of course, hydrangeas love water so I hope it rains soon to keep those blooms looking their best. I came upon this lovely rose-coloured hydrangea being sold at one of my favourite garden centres in Albrighton, Wolverhampton in the West Midlands. Blue hydrangeas need an acidic soil of PH 4-5 which can be difficult to maintain in a garden setting. 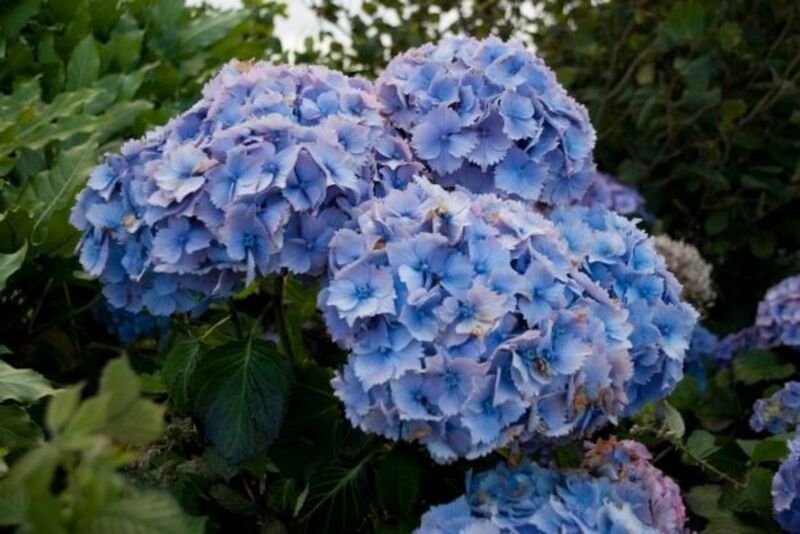 By planting a blue hydrangea in a container you have control over the acidity in the soil. It is important to use an ericaceous soi, which has a PH between 1 and 7 and to add aluminum sulphate to the soil. For more information refer to the reference section at the end of this page. 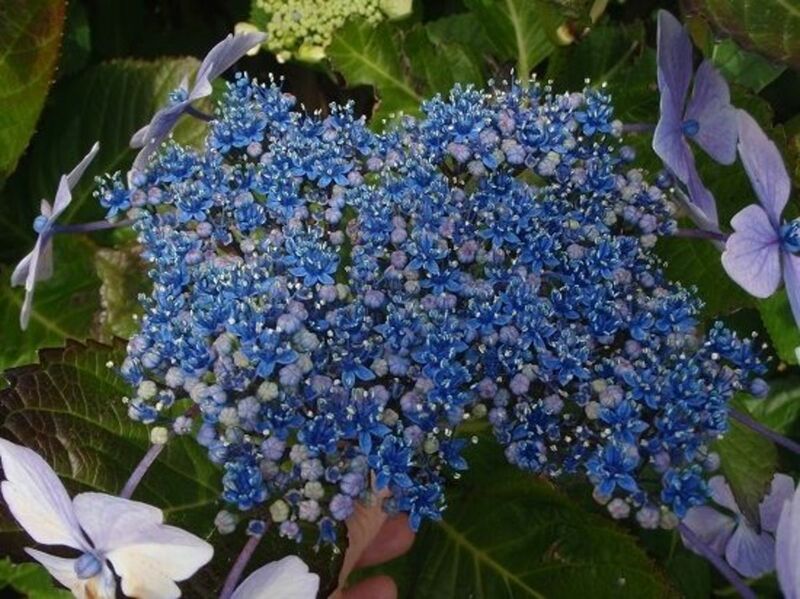 Aluminum Sulfate turns hydrangeas blue by lowering the PH balance for acid loving plants. Some other acid loving plants are heathers, blueberries, and azaleas. 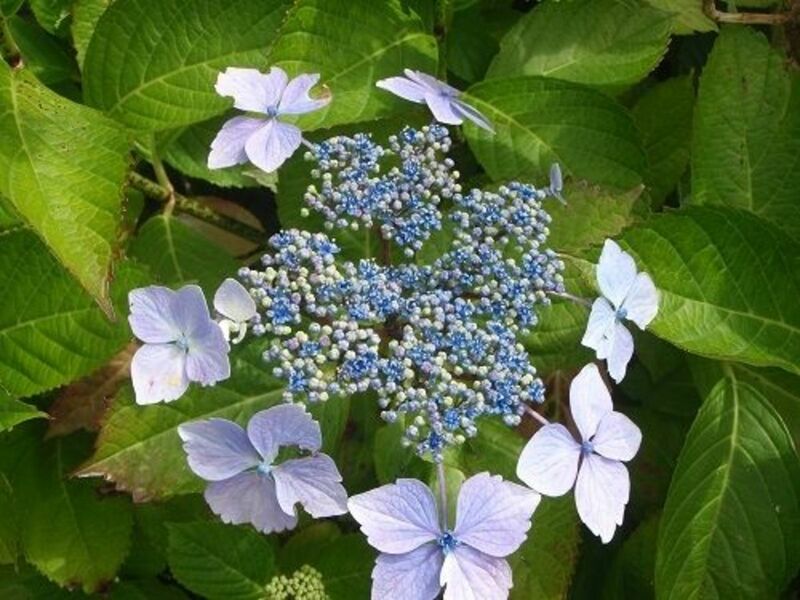 Blue Hydrangea Gardening Products - Control the PH level of your garden for colorful hydrangea. 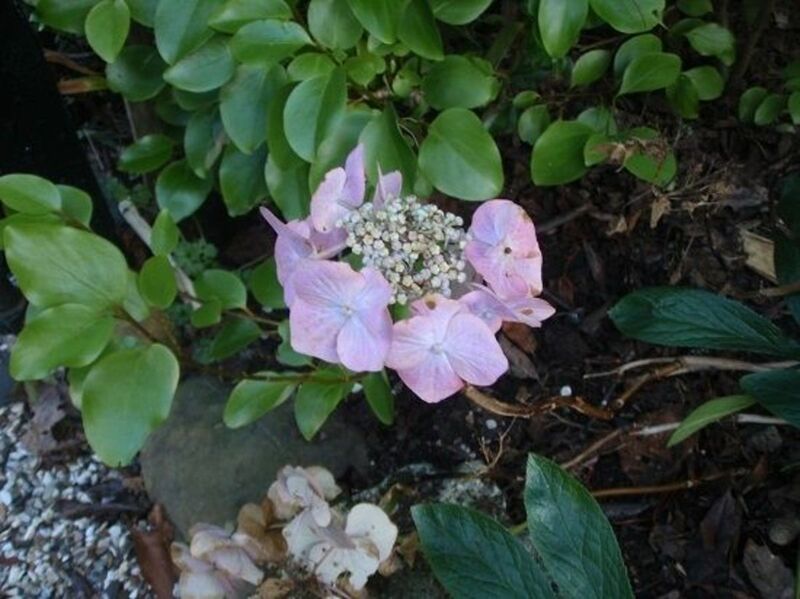 Hydrangeas react to the PH balance of the soil and thrive best in acid-loving soil. 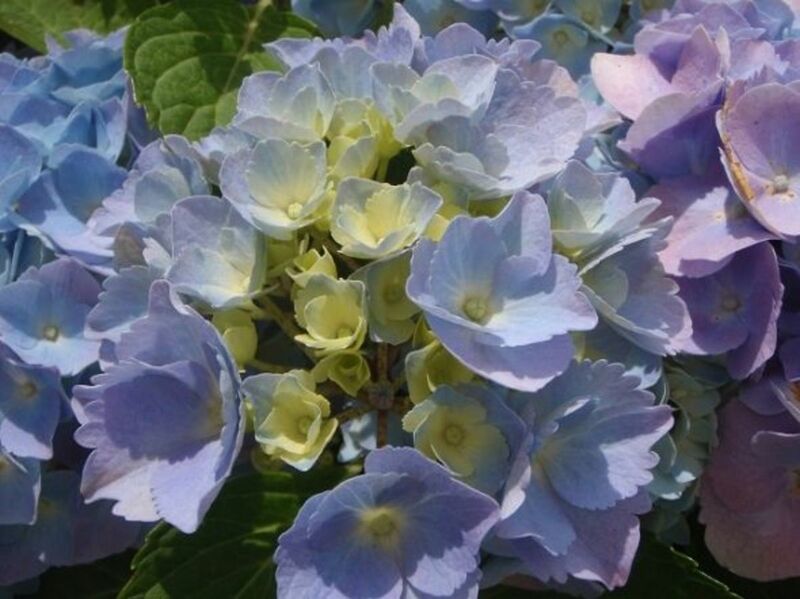 Blue Hydrangeas become blue due to the amount of aluminum sulfate in the soil. Bonide #705 4LB Aluminum Sulfate works on all soil types and there is an information leaflet giving you directions on how to achieve the desired results. A soli testing kit will give you an indication of the PH level of your soil - invaluable to any serious gardener. This hydrangea took my interest because of the subtle pale yellow colouring that coordinate so well with the blue. 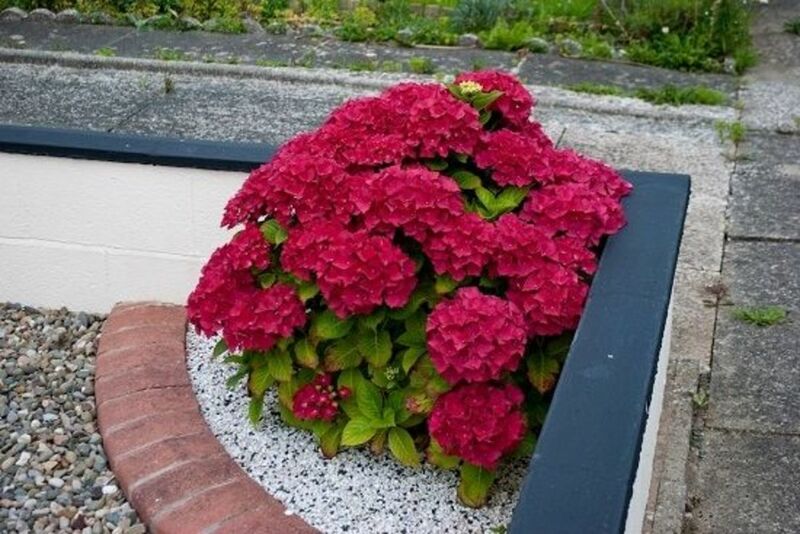 Imagine what a spectacular display this hydrangea would make against a pale yellow house. 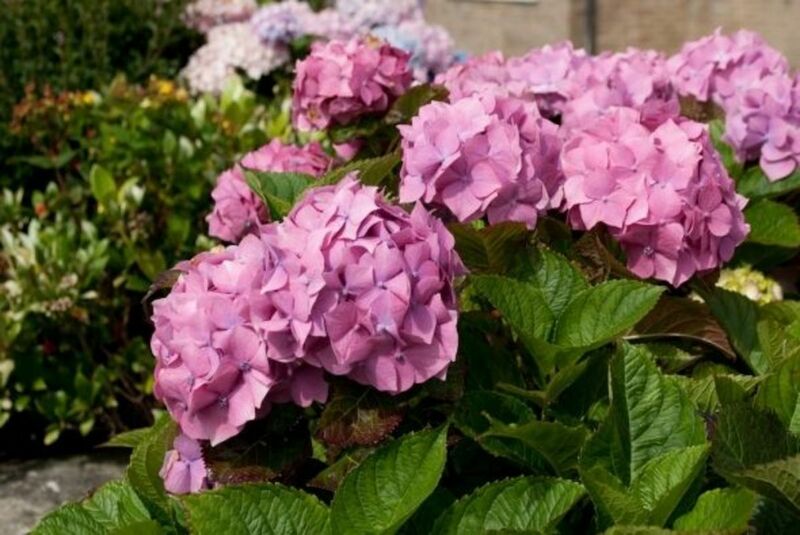 The Hydrangea Macrophylla 'Hortensia' comes in many varieties and colours but the mop-head variety is probably the most familiar hydrangea in gardens throughout. The mop-head shape reminds me of the pom-poms carried by cheerleaders at American football games and some grow to be the same size. 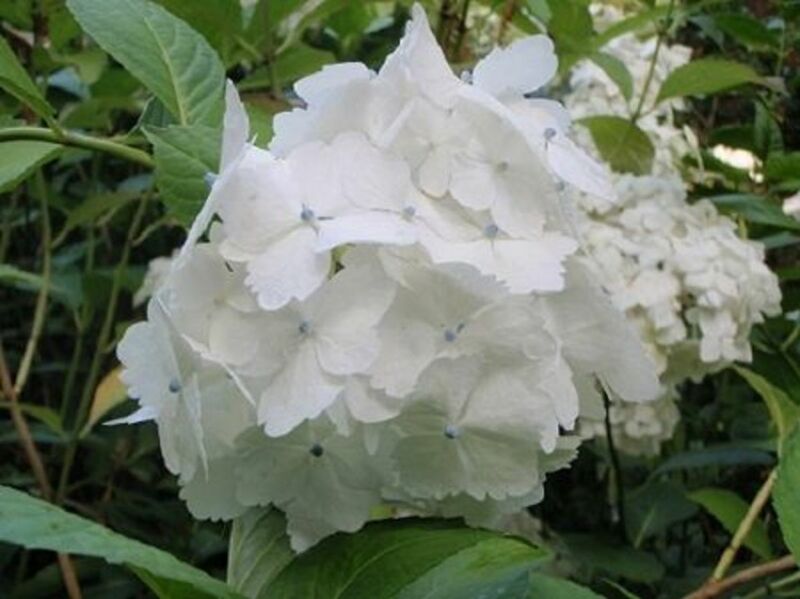 A dainty hydrangea that grows in moist, well-drained soil. 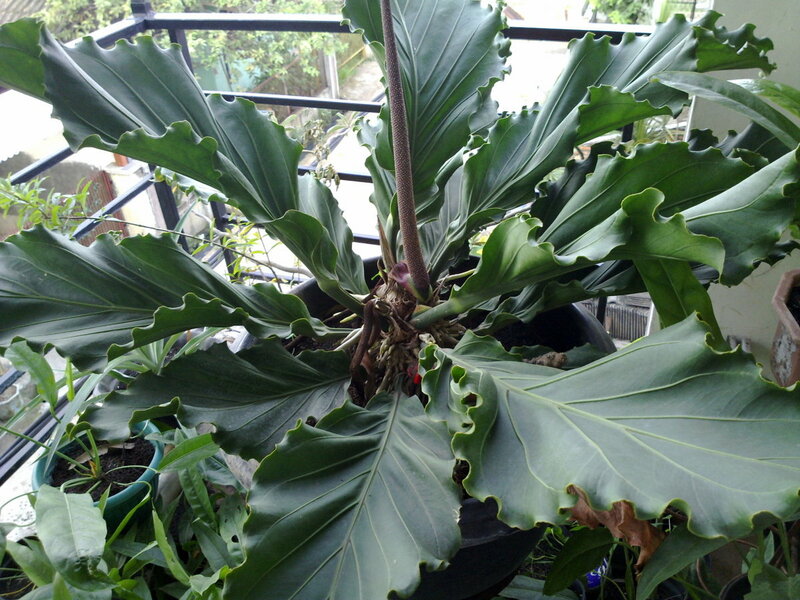 It tolerates sun and partial shade. 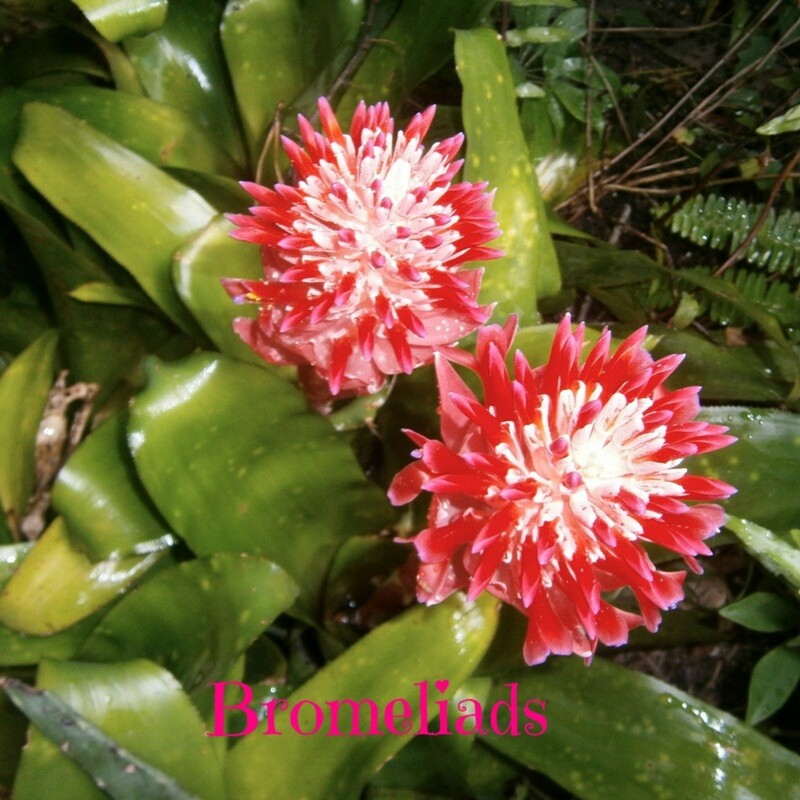 If you have alkaline soil the flowers may turn pink. To keep the flowers blue, or to turn them back to blue, add aluminum sulphate to your soil. This variety is a real asset to any garden. I have planted the one in the picture just outside my living room window for easy viewing. I saw this hydrangea on one of my evening walks as the sun was setting. 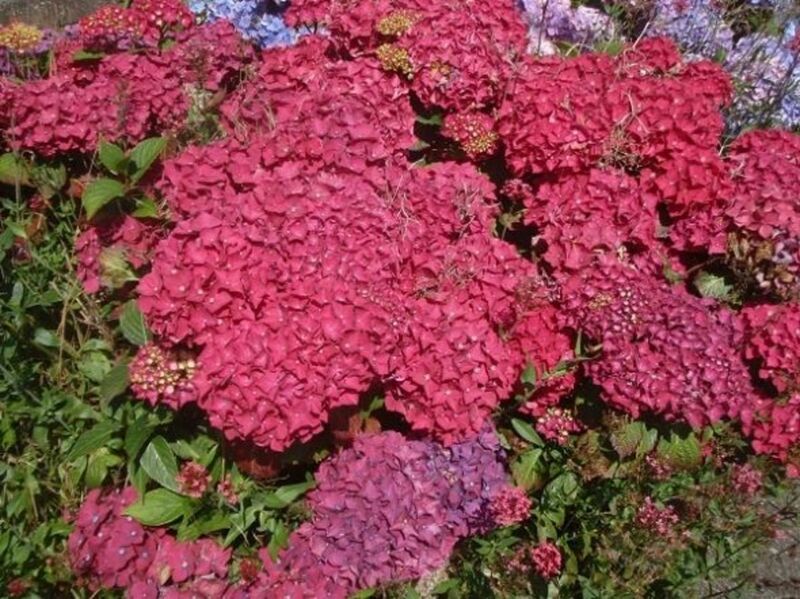 Red hydrangeas aren't as common as the pink and purple varieties so it is always a treat to see one. 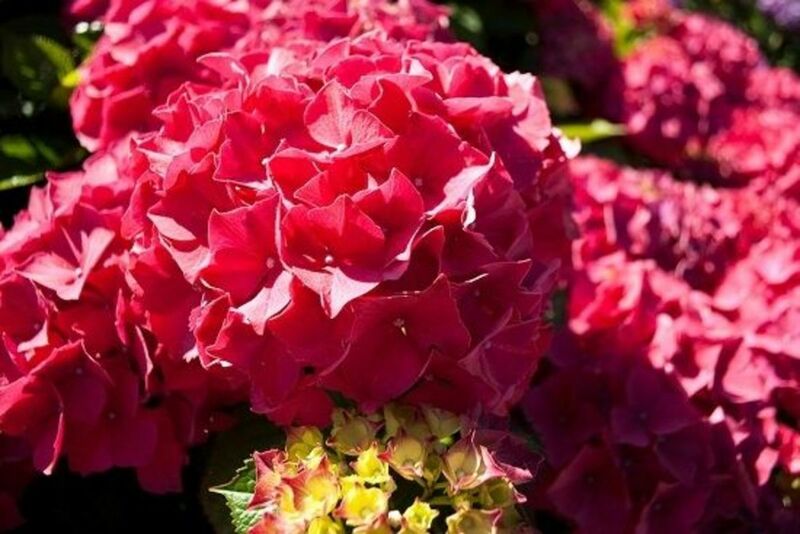 Red hydrangeas require an alkaline soil. I live in an area of acidic soil so this variety has been contained in a small area of non-acidic soil to keep the pure color. 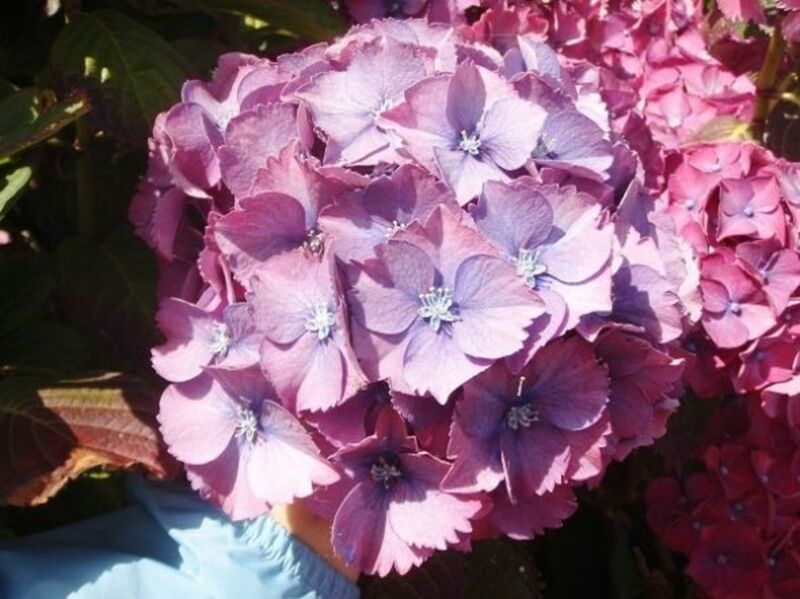 This purple hydrangea includes many subtle colour variations - A real work of art!! 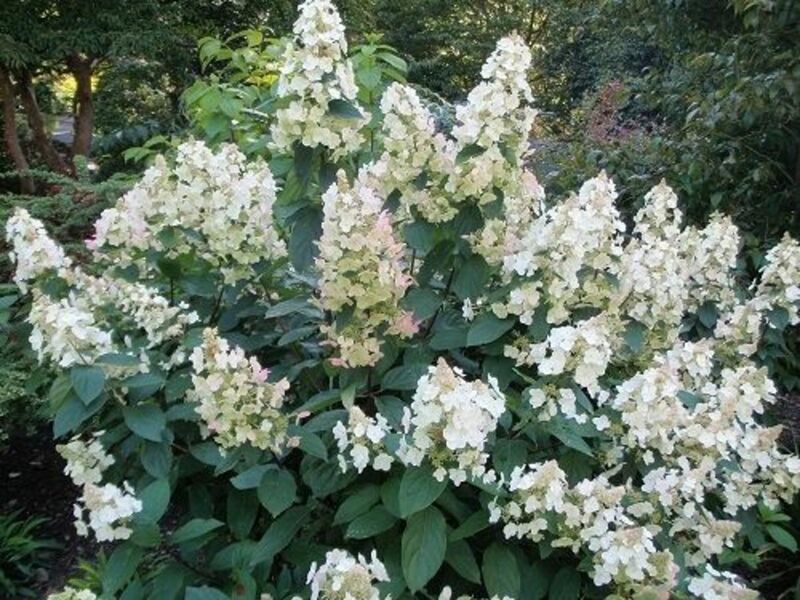 White Mop-Head Hydrangea - White hydrangeas aren't pure white but have a tinge of other colours like pink, mauve, yellow or blue. I saw this bush at Bodnant Garden in North Wales on the last day of summer. 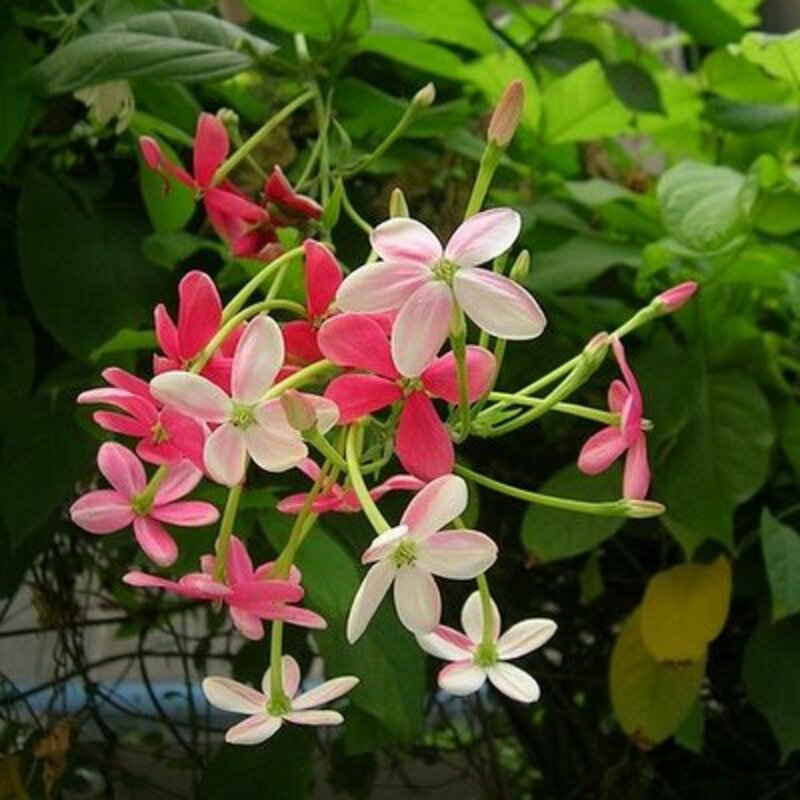 It lights up any area with its creamy white flowers. It turns a pinkish colour as it ages. We all need a little help even with plants that are relatively easy the grow. Here is a list of four well-respected books that will help you grow the healthiest, most colourful hydrangeas. 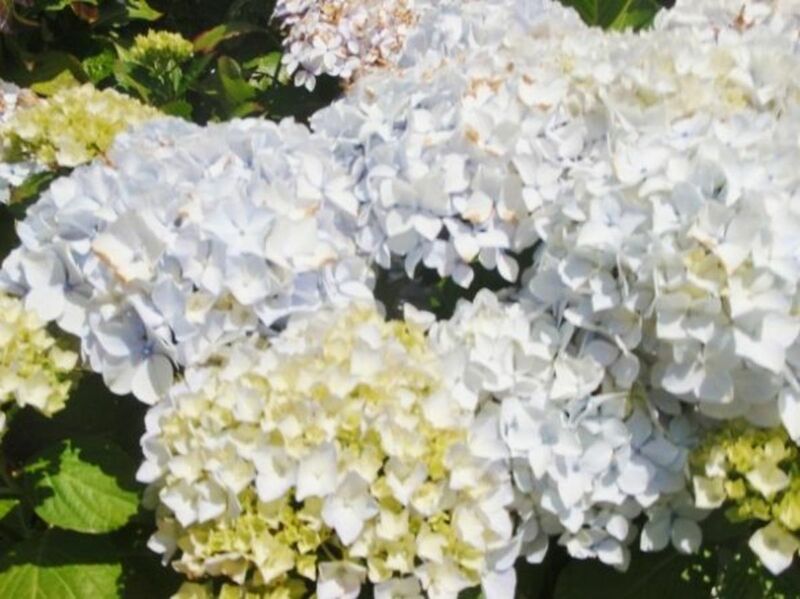 A website that shows you how to change the color of your hydrangeas. On January 24th we took the Arriva Wales train to Porthmadog and then walked through to a lovely village called Borth-Y-Gest. As we walked up the path before descending into the village, I spotted a very brown, brittle hydrangea bush by a wrought iron gate. As I passed I noticed green healthy foliage and then something purple caught my attention. There was one lone purple hydrangea flower that had survived the cold temperatures, torrential rains, the snow and gale force winds that we have experienced over the last few months. It was very uplifting seeing a little bit of summer in the middle of winter. After having seen a green, flowering hydrangea in January, I would love to hear from you.Have you also seen hydrangeas that have beat the odds and survived the winter? Tell me about your hydrangeas. - Thank you for taking time to look at my article. Come back soon! Beautiful pictures! I particularly like the compact royal red. I have not had a lot of success with hydrangeas but I think I have been putting them in the wrong area. Thanks for the inspiration. I think I will try again next year! I love the pure red ones, they are rare. Great pictures, info and presentation. I don't have any hydrangeas...I live in the desert. But I sure do appreciate the gorgeous photos of these beauties! I remember the hydrangeas at my Aunt's house where we visited in my childhood.......I thought they were just amazing then, and still do. Your lens gives wonderful tips on how to get different colors and maintain the blooms. Thank you so much for sharing these wonders with us. I am in love with hydrangeas! Your pics are magnificent. The flowers and the photos are so beautiful. 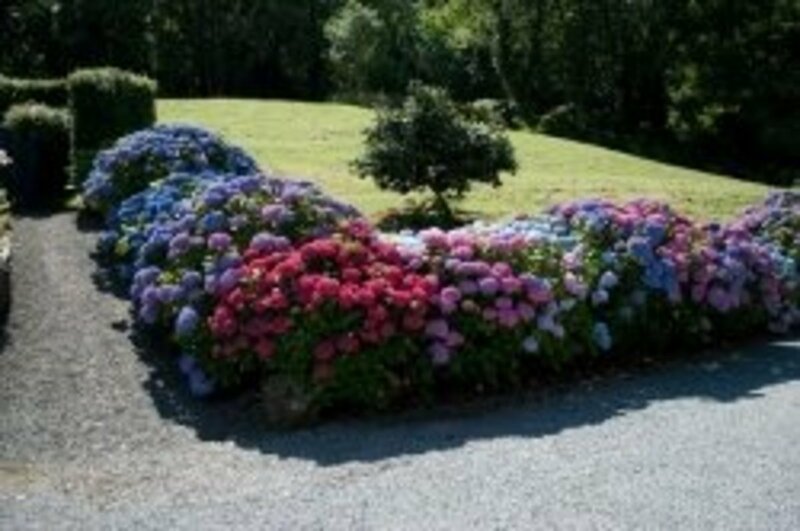 I am not a gardener, but my mum is a fabulous gardener and she has some beautiful hydrangeas. Such a beautiful, colourful lens - thank you!